West Harlem is the only community in the northeast that is home to two national memorials — Ulysses S. Grant National Memorial Park (see Riverside Park) and Alexander Hamilton’s Hamilton Grange. The Grange, which was named for Hamilton’s ancestral estate in Scotland, was his country home, designed by John McComb Jr., and originally sat on Hamilton’s 32-acre estate-the house was erected on what is now 143rd Street. Hamilton was one of our Founding Fathers and the first Secretary of the Treasury. 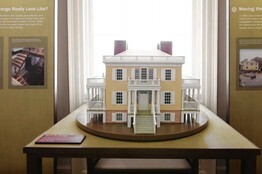 The two-story Federal-style frame house was completed in 1802, just two years before his death in a duel with Aaron Burr, another Founding Father, and the nation’s third Vice President. The Grange was moved four blocks west to Convent Avenue in 1889. The original porches and other features were removed for the move. The staircase was removed and retrofitted to accommodate a makeshift entrance on the side of the house and the original grand Federal-style entrance was boarded up. To make room for the development of a row house community, the developer gave the Grange to St. Luke’s Episcopal Church, which in 1885 erected its landmark church at 141st Street and Convent Avenue after moving uptown from Greenwich Village. The Grange was wedged between the church and an apartment building which obscured its original beauty. It was purchased by the American Scenic and Historic Preservation Society in 1924, opened to the public nine years later, and donated to the U.S. Department of the Interior in 1962. In 1960 the property was designated a National Historic Landmark and in 1967 it was designated a New York City landmark. It was moved inside St. Nicholas Park (still inside the boundaries of Hamilton’s original estate) in 2008, which allows it to be returned to its former glory with the original porches, main entrance doorway, and main staircase. When it reopens some time in 2011, the public will again be allowed to enjoy guided tours inside the national landmark. Checkout the statue of Alexander Hamilton in front of St. Luke’s Episcopal Church before going into The City College (CCNY) of the City University of New York. Here you will find the most beautiful Collegiate Gothic-designed buildings in New York City. Transportation: Bus—M3, M100, M101. Subway—A, B, C, D to 145th St.
St. Mark’s United Methodist Church traveled a long way from the Tenderloin in Midtown, to San Juan Hill on the Upper West Side, and to its current home in Harlem. Throughout its journey, monumental achievements happened along the way. Founded in 1871, out of Mother A.M.E. Zion Church in Philadelphia, PA by William F. Butler, the church’s first location was at 65 W. 35th Street, the site of the former Church of the Resurrection. Then it moved to its second home on the Upper West Side at 139 W. 48th St., the former All Souls’ Church. The next stop was at 231 W. 53rd Street, the former St. John’s Methodist and remained there until 1926. The last and final stop for this house of worship was built by Sibley & Fetherston between 1921-1926. This majestic church sits between Edgecombe and St. Nicholas Avenues with St. Nicholas Park as a magnificent backdrop. The yellowish sandstone Gothic inspired church glimmers when the sun hits it and is truly a wonderful structure. During the course of St. Mark’s journey to find a permanent home, the church was laying a strong foundation in the community and was able to achieve the following – it was the first to form a literary forum for all denominations, first African-American church to become a full member of a white annual conference, first African-American congregation to build a church costing more than a half million dollars, and to have two of its pastors appointed as district superintendent. St. Mark’s was fortunate enough to have had two strong visionary leaders at the helm of their Church – Reverends Brooks and Hicks. The Rev. Brooks is a founder of the National Association for the Advancement of Colored People and the National Urban League, and Rev. Dr. John J. Hicks, who commenced his relationship with the church in 1964, was also associated with the NAACP and the Harlem Branch of the Young Men’s Christian Association, and was involved in community service in other ways, as well. Stroll over to Hamilton Grange, the estate of Alexander Hamilton named after his ancestral estate in Scotland. Recently renovated and located in St. Nicholas Park, guided tours of this national landmark are available. The Harlem School of the Arts is a must stop for theatrical, music and dance productions by students with promise in these disciplines. Transportation: Bus—M3, BX33. Subway—B, C to 135th St.
I’ve been traveling a lot and used many Sutro guides but the this one is one of the best so far. 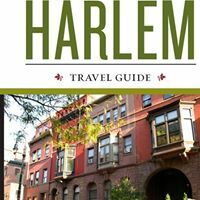 Download the free Sutro World @ www.sutromedia.com/world and purchase the in-app Harlem Travel Guide today for $2.99! The Hamilton Grange, the upper Manhattan house built by Alexander Hamilton, reopened to the public in September after a half-century of work. that included a relocation. Owners of historic property regularly complain about dealing with government landmark agencies, which can be sticklers for keeping New York’s great buildings looking the same for the ages. These critics can take some consolation by looking at the recent rehabilitation of Hamilton Grange, the upper Manhattan house built by founding father Alexander Hamilton. It shows just how persnickety a preservation project can be. The story dates to 1962 when Congress agreed to give historic monument status to the house on the condition that the National Park Service relocate the building and recreate Hamilton’s vision of a country retreat in Harlem away from the bustle of the city. 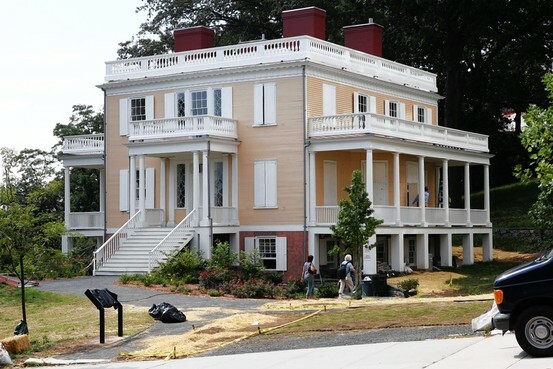 Nearly a half-century later, the job is done: The Park Service went as far as spending $14.5 million to jack the house up more than 40 feet and roll it down the road from its previous location, a cramped lot on Convent Avenue, so that the view from the porch more resembles what Alexander Hamilton saw when he walked on it more than two centuries ago. 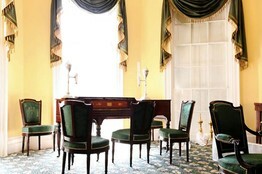 The sitting room with the original piano . The house, which has museum displays on the ground floor and a recreation of its original interiors above, reopened to the public in September, and from an architectural and landmark perspective is an exciting, fascinating success. Walking south along St. Nicholas Avenue from the B train stop, one turns the corner at 141st, starts westward up the hill, and is suddenly transported back when Harlem’s map was spotted with country estates, streams, fields, farms and hunting grounds. Other historic redevelopments, of course, don’t have to go through this kind of scrutiny because landmark agencies give commercial projects more latitude. Last week, for example, the city Landmarks Preservation Commission indicated it was close to approving developer Jared Kushner’s plan to build a glass penthouse on top of the landmark Puck Building in SoHo. Earlier plans by Mr. Kushner were rejected because the changes would have been too visible. The latest version “has calmed down,” Frederick Bland, an architect and one of the commissioners said last week. A trip to Hamilton Grange is a reminder why it’s important to do this. In the middle of a dense, highly residential part of central Harlem known as Hamilton Heights now sits a genteel, federal-style pinewood cottage, with peach siding and thin, graceful white columns framing its veranda, overlooking the park’s sloping swath of green. The original architect was famed Federal-style designer John McComb Jr., who also was the architect of Gracie Mansion and New York’s City Hall. Mr. McComb built at the nadir of the Federal period of architecture, which, like the Georgian before it, suggested an American style based on the classical proportions of ancient Greece, but which lightened its architectural elements, adding graceful flourishes and swapping smooth stone and wood materials for heavy Georgian bricks. Hamilton Grange is a shining example of the style. Built with an almost aggressive symmetry—Mr. McComb added two non-functional chimneys to the building just to balance out its roof, and the interior lobby presents the anteroom and the dining hall as mirror images of one another, arranged around a bust of Hamilton himself—the house suggests a rationality that isn’t accidental. The Founding Fathers sought to express their sense of Enlightenment-era logic in everything they did, from the Constitution to the houses in which they entertained. Hamilton Grange’s new home isn’t the original site of its construction, which was near where 143rd hits Amsterdam Avenue today, and because of encroaching street grid and the development of Harlem, couldn’t be. Its front entrance no longer faces southward, as the original did, and some of the original conditions on the interior were impossible to re-create, because historians couldn’t divine the intentions of Mr. McComb. Historical architects have restored the house’s front and back porches, which were lost in the Convent Avenue location, giving the cottage, which is actually quite small, a bit of the sprawling affect of a country estate. On the location question, the Park Service has made the best out of a bad situation. Mr. Laise says the National Park Service considered at least four sites for the house, including Central Park, Riverside Park, the south part of the City College campus, and near the Dyckman farmhouse in Inwood. It settled on the current location because, among other reasons, it is within the footprint of Hamilton’s original, 33-acre estate. Another effect of the relocation is that the house gives new purpose to a public park: a conduit to history. 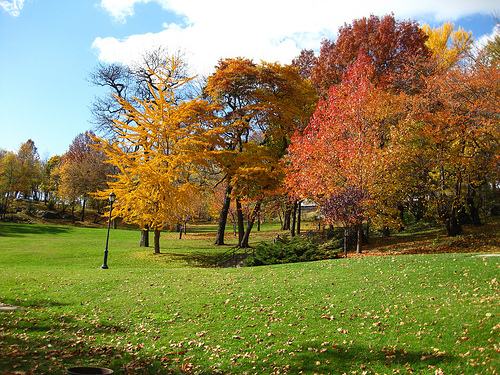 Park planners have long worried that St. Nicholas Park, a 23-acre swath of green that runs north-to-south alongside the campus of City College of New York, had become a dodgy no-man’s-land after daylight hours and had been looking to add more positive, public use to it. 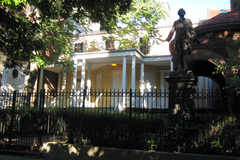 Alexander Hamilton lived in the Grange for only two years: The house was completed in 1802, and he was killed in 1804. But thanks to good planning and the National Park Service’s right-sized sense of the importance of historical architecture, Hamilton’s version of New York City lives again.